This MOHAA clan disbanded because of a feud between the two leaders, Pheonix and Webber. Pheonix went on to form League of Gentlemen (LoG) and Webber formed 47th together with his girlfriend Pixie. Some of the former members of the 101st joined Webber. Among them were Rice (Ripper), Menace, Warrior, Stormie and Shinobi. Under Webber 47th didn't play a lot of matches. If a match was played usually the same 6 or 8 would play. As a result a lot of members became inactive. Webber decided to "remove the dead wood" and re-energize the clan resulting in renaming it 47thR (the R for Reborn). Nothing really changed and at the beginning of December 2003 all communication with Webber (or his girlfriend Pixie) was lost. Rice who was paying for all servers at that moment received an email with all the passwords and that was it. On December 15th 2003 a group consisting of longtime members Rice, Warrior, Menace, Stormie and Emperor Mule decided it was time to come into action. It was decided that Rice would take full control of the clan and the others would assist him where needed. Warrior set up the forum, Menace rebuilt the website, Stormie and Mule did the research on the medals and rank-structure we wanted. Later on Diamond joined in to help out. After all was in place and done we informed all members where only the reliable members got an invite to stay. The first HQ that was formed consisted of; Rice (Clanleader), Warrior (2nd in command), Menace (web admin) and Diamond, Stormie and Mule became company leaders. Because HQ wanted an active clan we registered for a few gaming leagues like, Clanplanet, CMoHL and Frag4All to play as much matches as we could. There were weeks where the clan would play 5-7 times a week with sometimes even 2 matches a night (friendly or official). Every Sunday there would be clan training where certain maps and strategies were practiced. As a result the 47th became a pretty good gaming clan winning a lot of 1st and second places in the different gaming leagues. 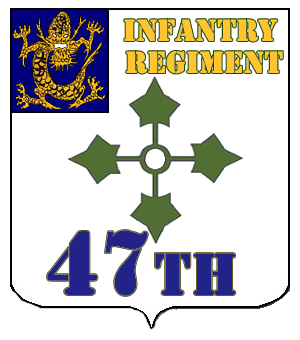 The 47th Infantry Regiment became the team to beat with players like Nightmare, Legolas, YinYan, Destroyer, Fraz and Rice (matchleader). During that period 47th ran a lot of times into LoG, who also joined the various gaming leagues. Matches between the two clans were often hostile because of the animosity between the two clans. Especially between certain members of the two clans. One time during a match for 1st place a league admin had to be present to referee the match. In the mean time some of the HQ members (Warrior, Stormie and Mule) had left because of other activities and were replaced by loyal members like Nightmare and Legolas and later Fraz, YinYan and Destroyer.